Well I have the decorators in and can't use my downstairs so unfortunately I have to spend all evening up here in my craft room. Now that's a shame. 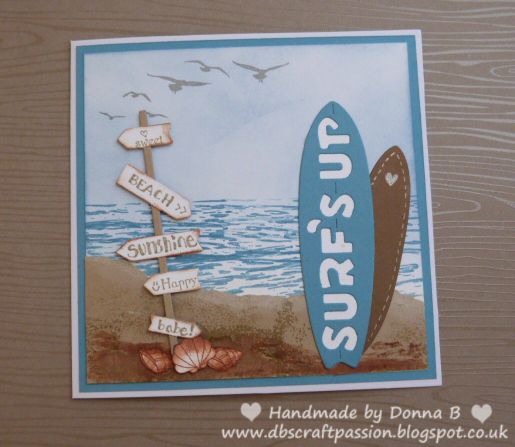 I has been so warm today I decided that I needed to make a nice beach themed card. 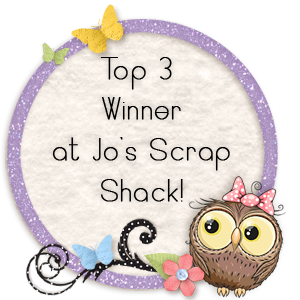 I started out with a 5x5" base then used some Stampin Up! Marina Mist for the layer. I die cut the sign post in Crumb Cake and White then out out the signs and used vintage photo on the edges. I wrote the signs in crumb cake marker. 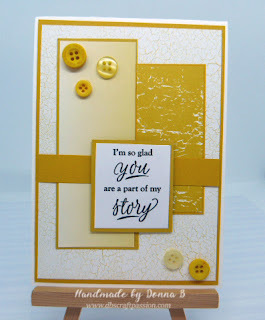 For the background I used Stormy sky Distress ink and also the High Tide stamp set. For the sand I just ripped a piece of card on a diagonal. To add a bit of interest I stamped a background stamp and then painted the foreground with the vintage photo. 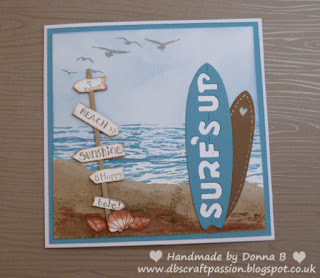 I die cut bot of the surf board one in blue and one in brown. Then cut out some shells and used dimensionals to adhere then to the bottom of the sign, as it was looking a bit bare.